This strong, exciting fantasy story holds potential to both draw new fans and hold longtime readers who may have aged to the far edge of the young adult market. The rich stew of the author's creations—SingleEarth, vampires, shapeshifters, Tristes, the Bruja Guilds—are at full boil here in the story of two 20-ish young women trying to out run their very different pasts, and figure out where they fit in and who they might become. Each has landed in a more "normal" place, and each wonders if, like a tattoo that can't be covered up, they can ever really fit into "normal." With a curious prologue set six years in the past, Amelia Atwater-Rhodes establishes the connection between the four main protagonists of Poison Tree. Set in a quick pace, readers will fly through its intrigue and violence, and come to a question-raising ending. 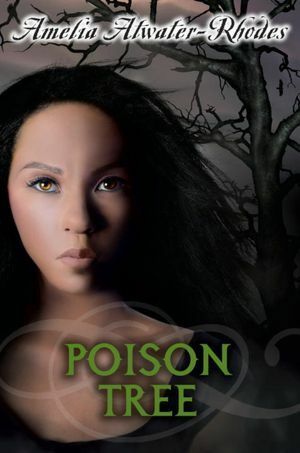 Poison Tree is a great story that could use more oomph. The central story revolves around Sarik, the African-Asian tiger shifter, running away from an abusive home, then finding her way back home to stand up for herself. Weaving in the other characters: Sarik's vampire boyfriend Jason, the newest SingleEarth mediator Alysia, and Frost guild leader Christian, ties the story together but leaves it seemingly incomplete overall. It is to be said, though, that Rhodes' ability to create relatable characters is astounding. Even in a paranormal world, her characters are realistic and their interactions with one another, understandable. Sometimes it's hard to pinpoint the characters' relationships with each other, when it isn't plainly stated, but not knowing will increase the mystique surrounding them. The ending of the story puts almost everybody in place, but readers will finish the story craving more from this strange world and its enigmatic cast. There's more beneath the surface of Poison Tree so hopefully there will be a companion novel to explore the hidden parts of this world.